“sculpted beauty/frayed by nature” – love that poetic dedication. Beautiful picture of nature’s forces playing together. It’s wonderful to hear that you enjoyed the photo and poem. I was grateful to Charly’s comment on this post… she inspired an edit to my original post that resulted in that particular line. Beautiful shot: from one Wilson to another! Great to meet another Wilson. I see you are geology-inspired. Can understand why… the complexities of our dynamic Earth are fascinating. 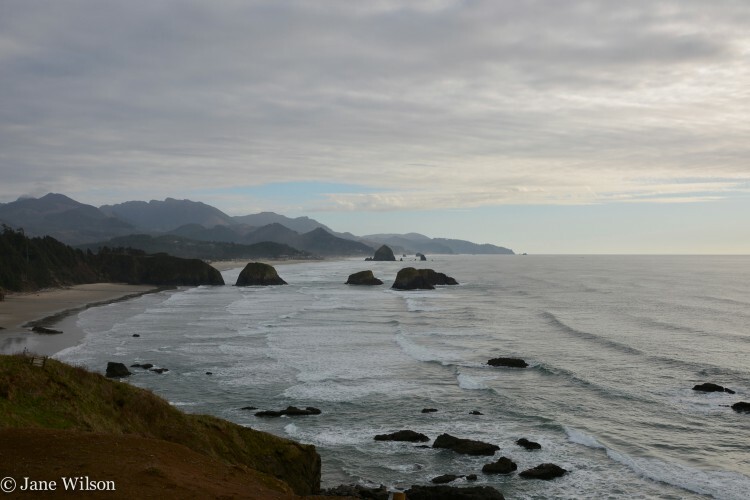 The Oregon Coast is certainly testament to that! Wonderful choice Jane – love the text you’ve included with it. perfectly matched! Beautiful, and a reminder that without nature, nothing but the hand of man could create a frayed edge. Hum, an intriguing thought, Charly. I wonder, without nature, would the hand of man have anything to fray? Your idea has inspired an edit that I will go back to make on my post. I think the idea of being frayed by nature versus being frayed by time is a stronger message. Don’t you think that fits better with the ideas in the poem? Good tie-in with the poem and peaceful photo. It does look peaceful in this shot, however, the coast is a very dynamic place no matter which viewpoint is selected: weather, climate, geologic… one of my favorite places! love the stacks out in the ocean… such a beautiful coastline. I agree with you, Megan. It is an amazing coastline. Ah, you’ve worked two meanings of “fray” into your poetic description. Well done! Thank you, Dandyknife. And to think you were there not too long ago. I think that is so wonderful.